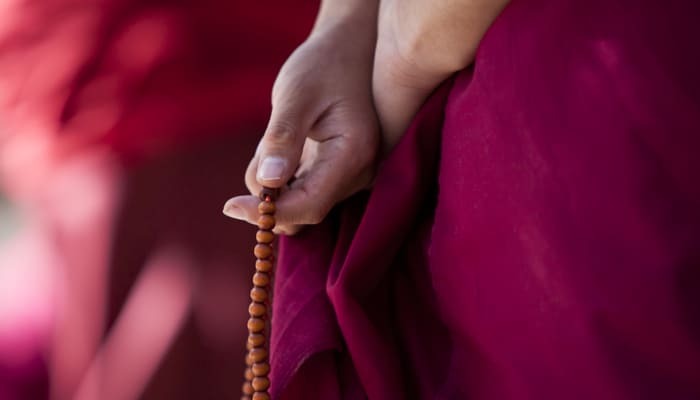 Summary: Isa Gucciardi, Ph.D., reflects on her trip to Menla Mountain Retreat Center, in Phoenicia, NY, to teach and support Tibetan monks from the Gaden Shartse Dokhang Monastery on their 2014-2015 US tour. Menla means Medicine Buddha in Tibetan, but I think the esoteric translation must be “magic.” Menla Mountain Retreat Center, located in the Catskill Mountains in New York, is a place unto itself. You arrive at Menla Mountain via a narrow road, which has turned off another small road. A sign at the turn off says “Dead End.” Perhaps not coincidentally, you are actually entering a crater created several million years ago, when a meteorite filled with all types of unearthly metals crashed into the site. The magnetic field, which still exists there today, is palpable, and it does a good job of interrupting all types of modern communication systems. In the center of the bowl created by this cosmic event is Menla Mountain Retreat Center, a well-maintained collection of beautiful buildings including a conference center, spa, barn, and lodges. From the bottom of the meteor crater, you look up to see the hills, forested with mature oaks and maples, and in the rain, the hillsides cascade with streams running down from the crater’s rim. The melody of the water complements a cacophony of hundreds of birds. I was happily kept up at night by a pair of owls calling across the valley. That was after I encountered a bear, which, thankfully, was quite smelly, and so warned me that it was watching me as I made my way to my room in the dark. Turkeys and deer appeared regularly to listen in on the teachings throughout the weekend. The teachings were those of Geshe Chophel, the spiritual master of the Gaden Shartse Dokhang Compassion Tour that FSS is hosting, and Robert Thurman, who is one of the most articulate and passionate interpreters of Tibetan Buddhism alive today. Bob managed, in articulating the nature of the Medicine Buddha, to tap dance into his favorite rap on nothingness (“There cannot be any such thing as nothingness because that would still be something…”) and the monks created a beautiful sand mandala of the palace, or home, of the Medicine Buddha. Geshe Chophel gave us a tour of the mandala itself before he offered the Medicine Buddha initiation to a group of about fifty people. The Medicine Buddha is like the patron saint of healers, and is, himself, a master healer. Tibetan medicine, a sophisticated system that recognizes the entire natural world as containing any form of medicine that might be needed, emerged from the field of energy of the Medicine Buddha. The Medicine Buddha depicted in thangkas is deep cobalt in color and holds the flower that cures all ills and a bowl of nectar which is an elixir for all disease. The mandala that the monks created out of colored and consecrated sand after the opening ceremony is a highly symbolic depiction of the field of energy from which the cobalt form of the Buddha emerges. In the center is an ornate gilt box that contains all the existing texts related to healing in Tibetan medicine. Around the center square of this box are the Eight Medicine Buddha Brothers, each in the form of a petal surrounding the center square, and each containing a sacred healing syllable referring to the type of medicine each brother carries. Around the brothers is a square frame of sixteen symbols contained in each of their own boxes. These represent the sixteen Bodhisattvas who return to the realm of suffering, after attaining enlightenment, to relieve the ills of those who are still caught in the cycle of suffering. Another set of twenty-four squares frame the square of the Bodhisattvas. Geshe Chophel said that these squares represent the wrathful deities who protect the medical knowledge and its practice contained in the inner squares. At the four directions, each with its own assigned color and element, are the four doors through which the initiate can approach the teachings. Geshe Chophel told us there was another layer of meaning beneath these symbolic representations whose interpretation is reserved for initiates who undertake a deeper study of Tibetan medicine. The monks worked for many days, patiently and persistently bringing the mandala to life. Normally, the mandala is dissolved right after its creation, as a reminder of the impermanent nature of life. But this mandala will become a centerpiece of the healing center that Menla Mountain is. However, a group of students participated in the dissolution of the previous sand mandala that another group of monks had created many years before. The monks offered the sand of that mandala into the pond which is at the center of the crater and offered marigold blossoms and milk to the naga, a type of nature spirit, of the pond. These offerings are made to ensure that the naga be healthy and happy and so be able to keep the natural landscape in balance. The magic of our time at Menla is counted in so many ways: the place which is like no other; the monks, themselves, coming from across the world, to create the mandala for the Buddha who is the center of the Menla Mountain Retreat Center; Robert Thurman was there to offer our students insight into the healing of the Medicine Buddha; the group of psychotherapists and healers, who happened to be there and were able to receive the initiation of the Tibetan healer to support them in their practice; and the group of students who came from far and near to learn at the knee of Medicine Buddha and all received insight and healing. The crisp, fall days were like a chorus of praise to the Medicine Buddha, supporting all who came to the end of the road that led to Menla.